I came across this caption on Instagram the other day and suddenly felt somehow melancholic and sad. Summertime sadness is a thing indeed, especially in Cambridge. I have said goodbye to a few people this summer and it didn’t bother me too much, until I actually sat down and wrote this. But before this gets too heavy-hearted I’d like to take the opportunity to highlight what’s great about summer in Cambridge. If you are a local in Cambridge, July and August are often not that fun. The town is crowded with tourists, language students take over the city centre, and the colleges, my favourite hideaways from all the bustle, close their doors completely. 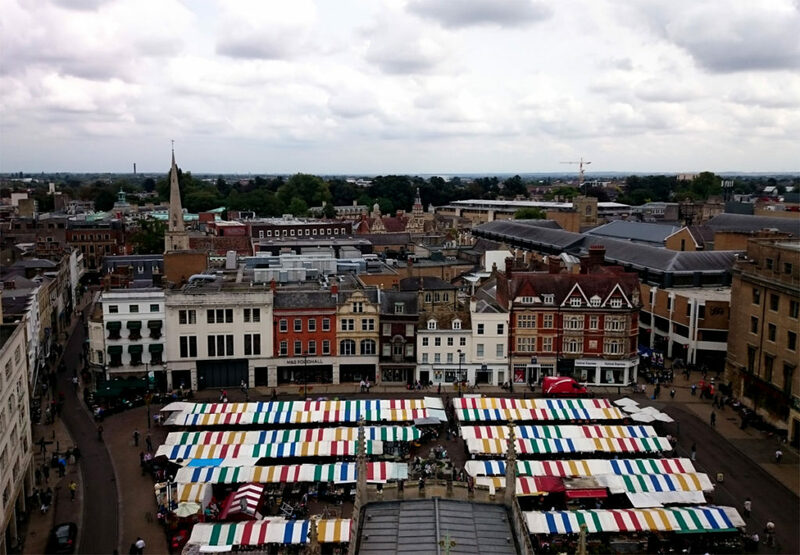 So what can you actually do as a local in Cambridge? After having lived here for almost two years I’m showing you my go-to places and activities for a great summer in Cambridge. Some events have already taken place, but they normally happen every year. So make sure to bookmark this blog post for next summer! Come rain or shine, you will always find a place to watch a film under the stars. 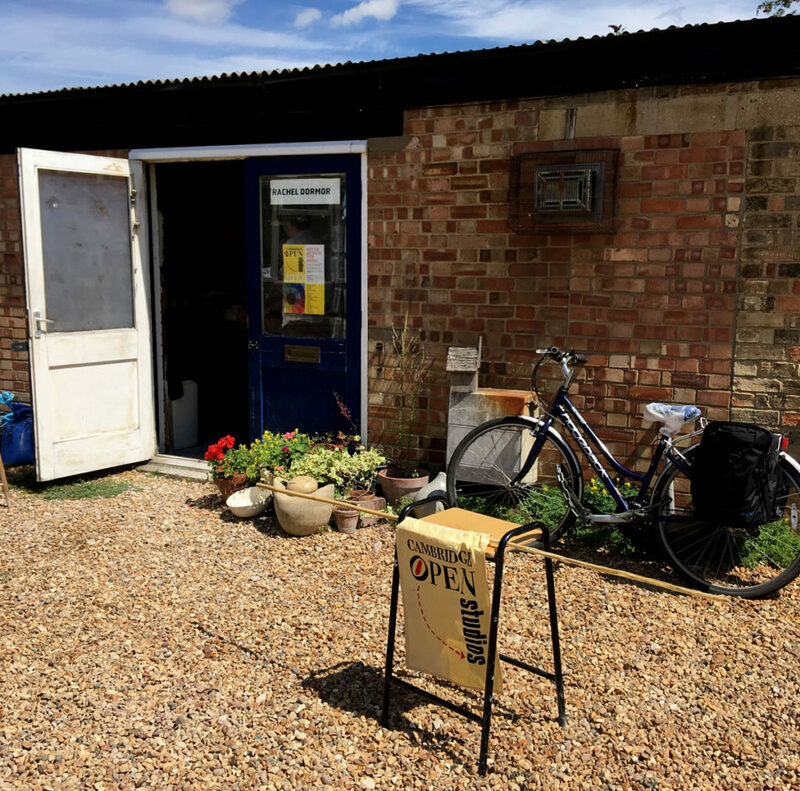 Enchanted cinema: Currently located in the beautiful Orchard Tea Garden in Grantchester, this pop-up cinema is more than your usual outdoor cinema. Before every film a local musician plays for the audience, an independent short or two will be screened and local street food vendors pop up alongside the cinema. 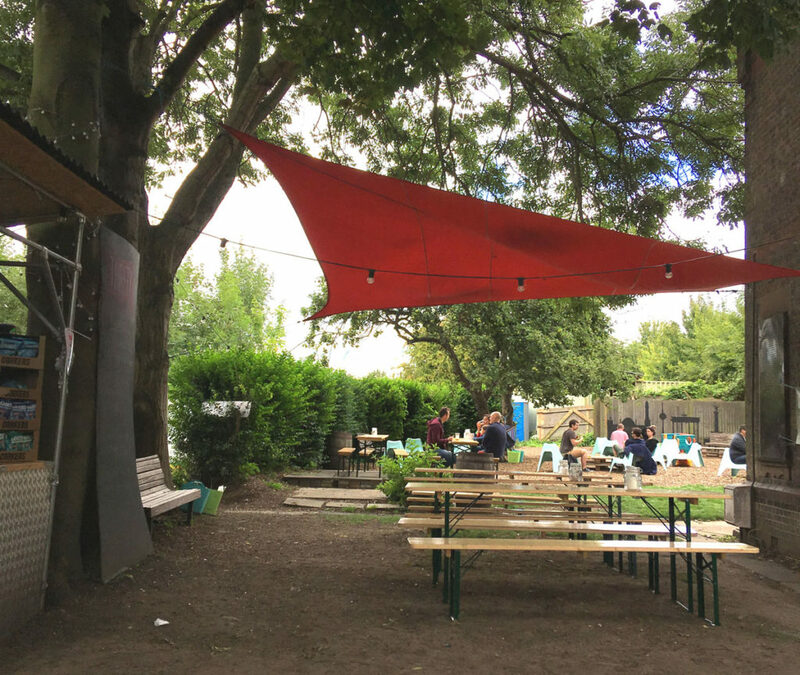 In September Enchanted Cinema will move to the Thirsty Riverside for the Biergarten Film Festival. 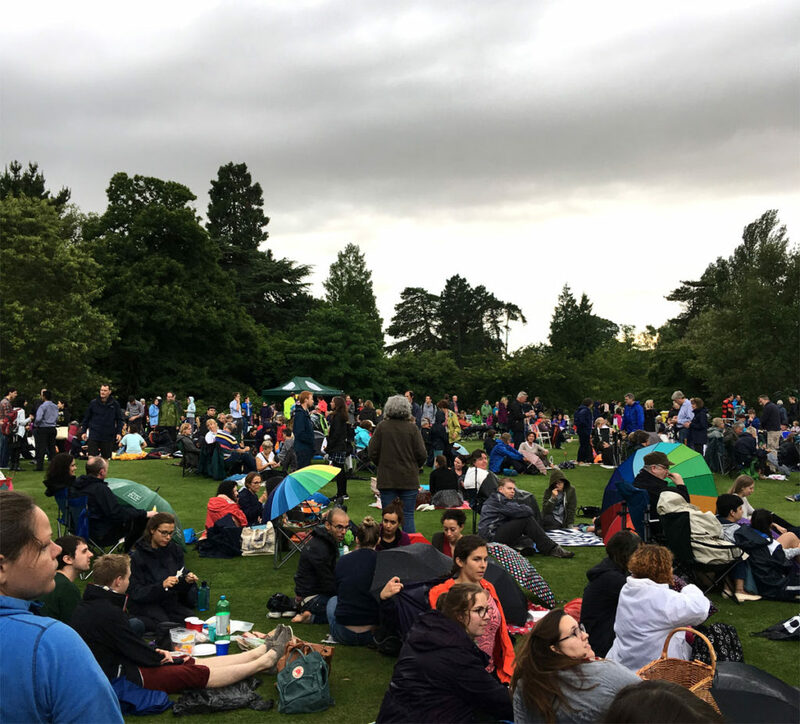 Movies on the meadows: This event is part of the Cambridge Film Festival and takes place on the August bank holiday weekend from 25th to 28th of August. The screenings will be just outside the Orchard Tea Garden on the big field right next to the river. Night Market: When the shops close the stalls on the Market Square open! Alongside local businesses, who offer a mix of food, drinks and gifts, visitors are welcome to watch a film for free. The next night market with outdoor film screening will be on 18th August (Toy Story and James Bond – Goldfinger). 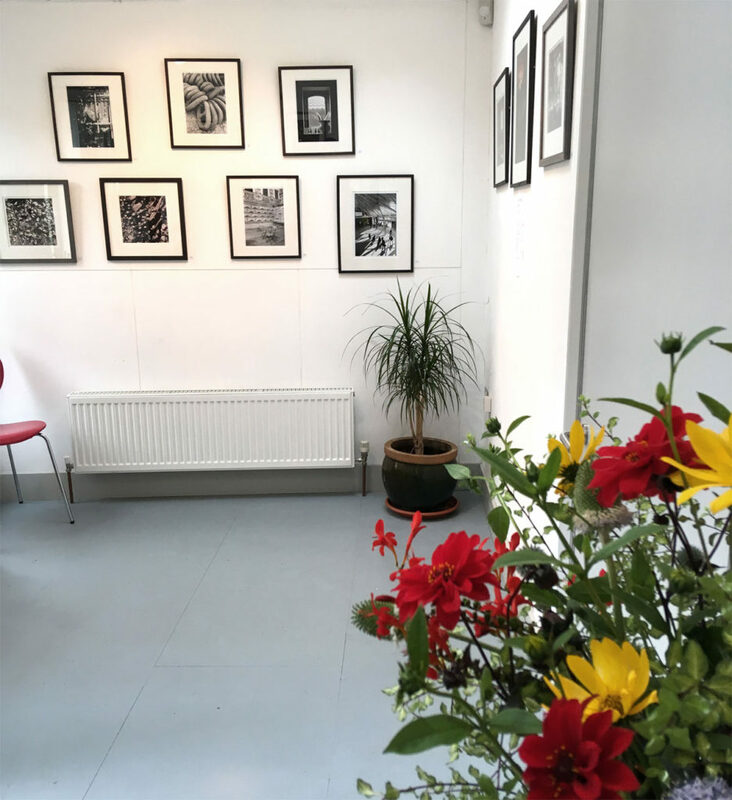 If you are interested in art and in meeting local artists this is your chance! 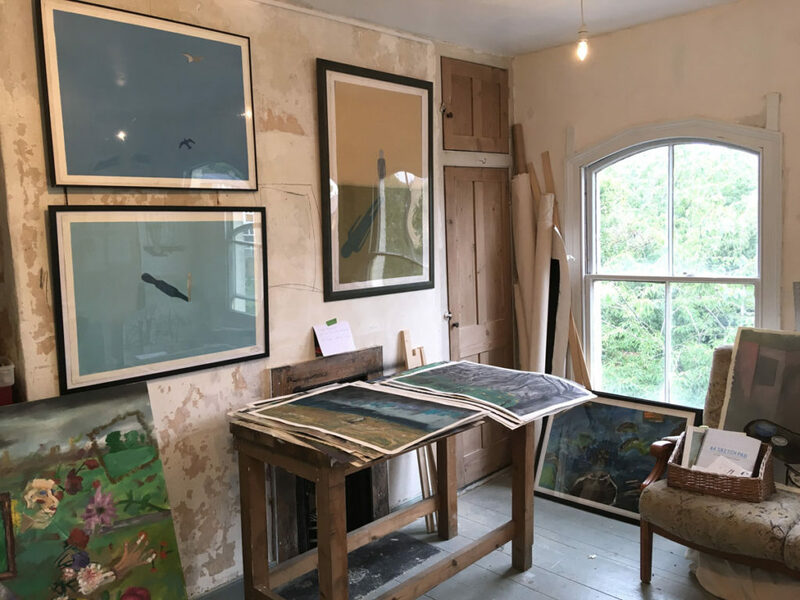 On four weekends in July artists in Cambridge open their studios to show their work to the public. Keep an eye out for the yellow flags to see paintings, pottery, photography, jewellery making and much more! The Big Weekend is a free outdoor event happening on the first weekend in July. Alongside a range of activities for the whole family there are various music performances and a firework! If you are a fan of the Middle Ages you shouldn’t miss this one. On the first weekend in September there will be a re-enactment of this medieval fair at the Leper Chapel, the oldest complete building in Cambridge. It’s an event for the whole family with dancing, singing, storytelling and musical entertainment. In July and August you get to watch a number of Shakespeare plays in the most picturesque settings – the Cambridge College gardens! 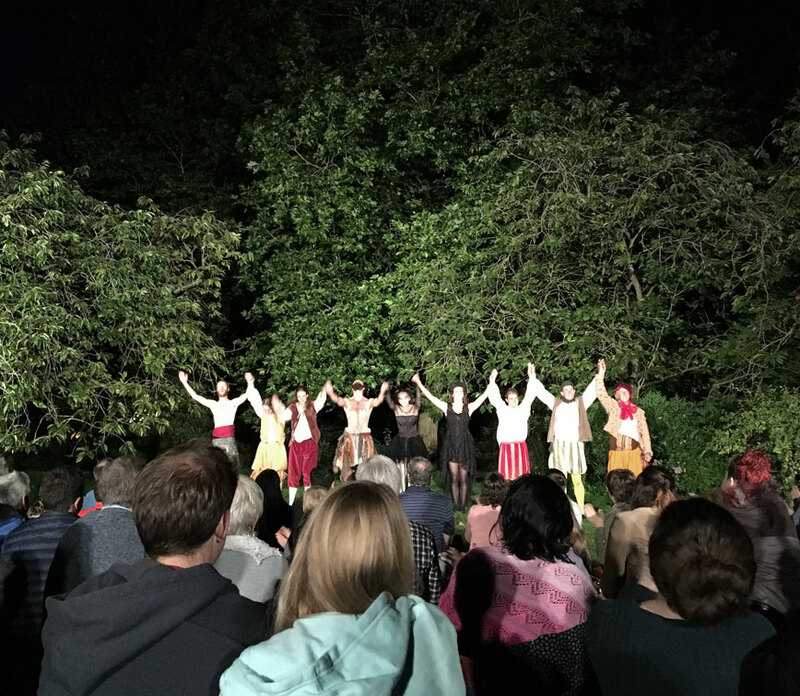 I went to see a Midsummer Night’s Dream in the Fellows’ Garden of Trinity College and it was truly magical. 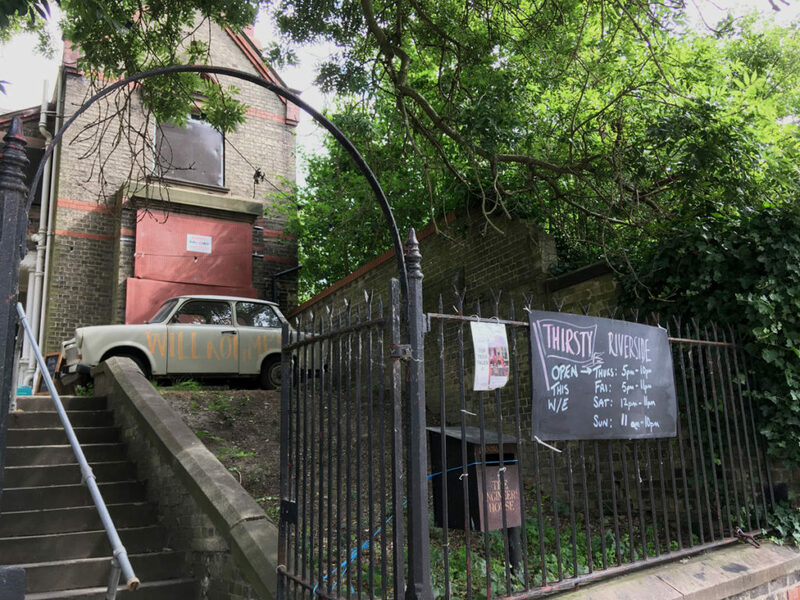 You can bring your own picnic and enjoy an evening of vivid theatre that strips away unnecessary theatrical artifice and gimmickry. On Sundays from June to September there are jazz and brass bands playing in Cambridge’s parks and open spaces. It’s a free event too, so all you need to bring is a picnic! This event is part of the Cambridge Summer Music Festival that takes place in July. Every Wednesday visitors can enjoy an array of life music on the Garden’s Main Lawn. No tickets are required but normal Garden admissions applies. Some companies have corporate membership for the Botanical Gardens and as a member of the Cambridge University you can visit the gardens without admission, so you might be able to attend this event for free too. I went to the last event on 26th July and it literally started to rain when the band began to play. But people here are normally prepared for sudden weather changes, so you get your umbrella and your rain poncho out and enjoy the event come rain or shine! This is one of my favourites as it reminds me of summertime in Germany. 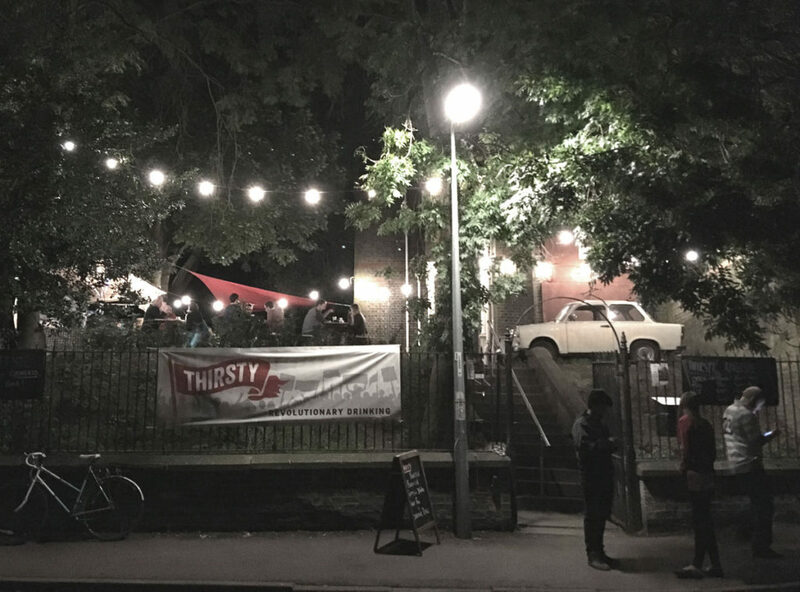 Thirsty is a bar on Chesterton Road but this summer they opened a German-style biergarten at the Museum of Technology on Riverside. From Thursday to Sunday you can enjoy craft beer, wine, spirits and softs (mostly from Germany) and food from local food trucks like Provenance, Al Chile or Buffalo Joe’s. The place to be on those long and mild summer evenings! 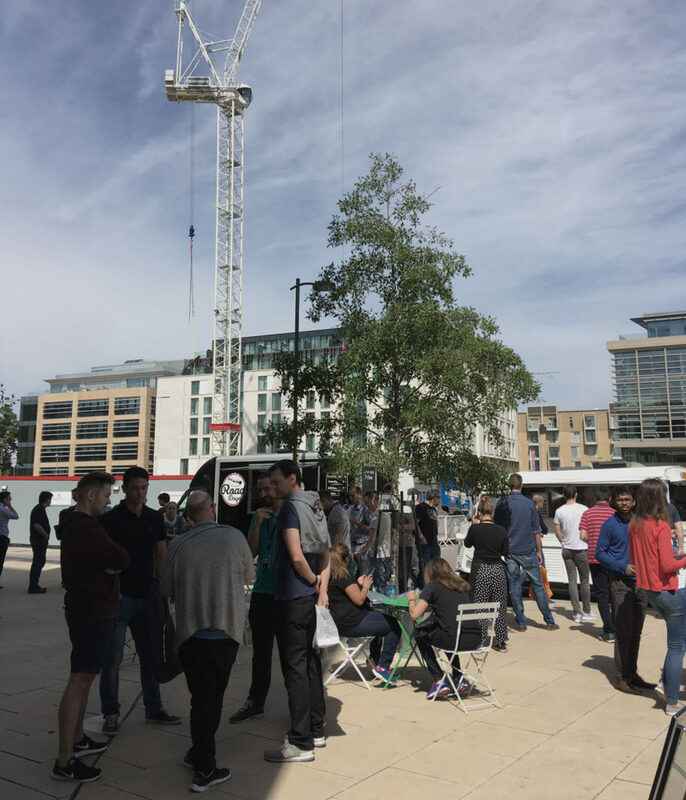 For those of you who are stuck in offices over the summer this collective of street food traders is a true glimmer of hope for lunchtime. Food can make so happy, especially when it’s tasty, locally sourced and healthy! 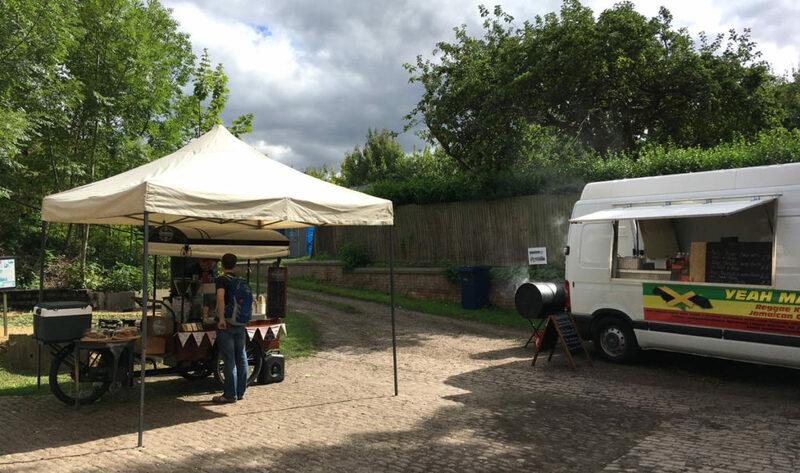 From Wednesday to Friday the food vans pop up from 12 to 2 pm at the West Cambridge Site, the Science Park and Mill Park off Station Road. If you can’t make it for lunch you can visit their next food night market on 30th September. 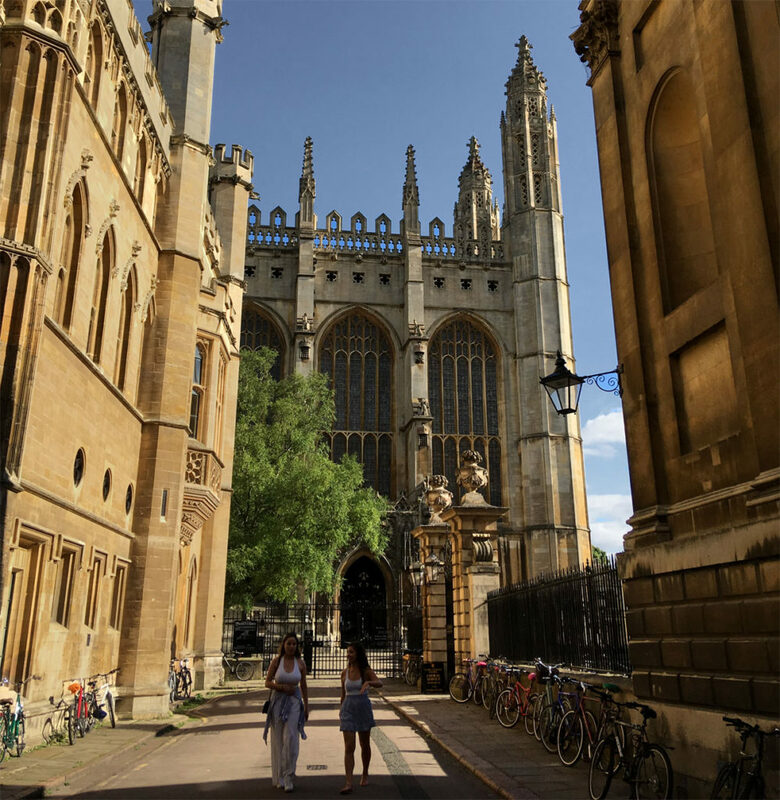 So these are some of the great things to do in Cambridge during summertime. Is there something I should add to my list? Post it in the comments!